It is most uninviting outside today, and I'm feeling an acute desire to trade the howling wind for warm ocean surf. 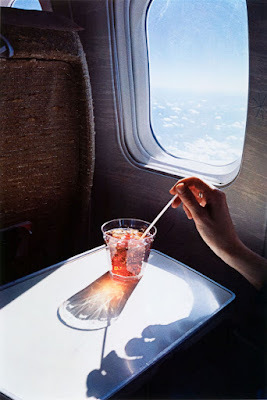 This image from the late '60s by Southern photographer William Eggleston reflects my current headspace pretty accurately. His ability to capture banal moments in such ways that they become beautiful is inspiring to me. Read an interview with Harmony Korine here. His work is currently on exhibit in London and NY (Chicago next month) if you are in the mood for a colourful and eye-opening afternoon out. Posted by la femme at 4:23 p.m.
Ja. Some stilinberlin inspired posts coming soon. Oh, this is a wonderful photo. I love the beautiful in the banal and less the banal in the beautiful but maybe I don't know what I'm talking about. Ps Thank you for your sweet comment on our blog! I love that photo. It reminds me of the pure joy of traveling, of a holiday, of that freedom...beautiful! Glad you are back! I totally agree, stunning photo!